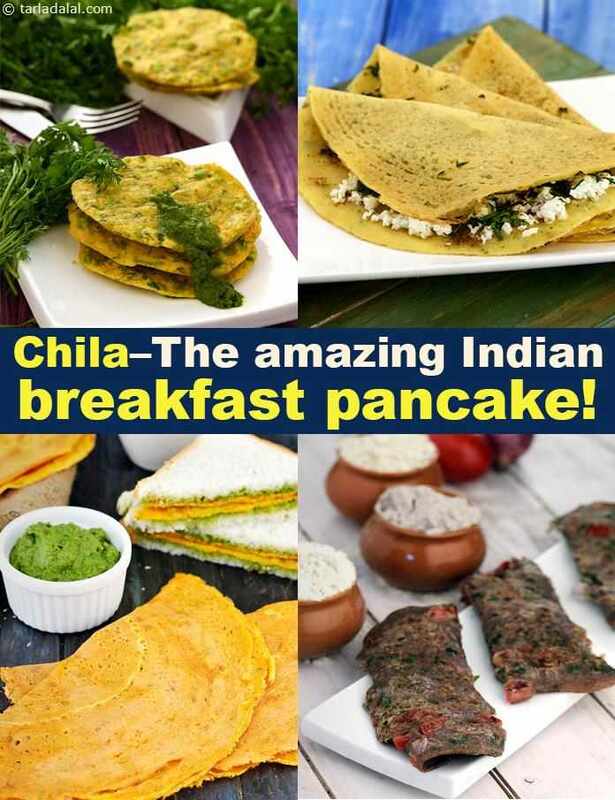 Chila – The amazing Indian breakfast pancake! Chila are Indian savoury pancakes. You can make them either with milled flours or with ground dals. They are nutritious and can be fortified with the addition of vegetables or paneer. A dash of spices enhances the taste greatly! Some chila batters require fermenting while others can be created instantly just by mixing together ingredients. Chila can be eaten anytime of the day- be it breakfast, lunch or dinner ! You can serve them along with chutney or ketchup. The famous besan chilla or popularly known as ‘vegetarian omelette’ are made using besan flour and a handful of ingredients. You can even add crunchy vegetables like onion and tomato to the batter and make delicious chilas, stuff them between bread slices to make an interesting besan chilla sandwich. The Besan and Green Pea Chila is another interesting delight which you can whip up in a jiffy! While I was watching my calories, moong dal chila acted like a savious. I preferred them for a light dinner or quick breakfast. They are delicious and versatile. You can make varieties of moong dal chilas by topping or stuffing them with different mixtures. You can make high-fibre chilas or healthy chilas with Jowar and Tomato and served with low-calorie green chutney, this meal is sure to make a smile bloom on your face. Some can be made and packed for the dabba too. Enjoy our collection of Chila Recipes.